1) Shu Uemura Eyelash Curler from David Jones ($40): I misplaced my Shiseido eyelash curler a few months ago and I'd been meaning to replace it for ages. The Shiseido one used to pinch my eyes a lot so I decided to just spend a little bit extra this time and buy the Shu Uemura eyelash curler instead and I'm so happy that I did as it's so freaking amazing! The funny thing is, every time I curl my eyelashes, I always wince a little bit as I expect it to pinch my eyelids but it never does and I always fall in love with it a little bit more. 2) Hourglass Ambient Lighting Powder in Ethereal Light from Mecca Cosmetica ($62): I was feeling sorry for myself yesterday as I went to the dentist in the morning and I left with the bottom right hand side of my face (including my nose!) completely numbed and I was REALLY hungry... so I went to Myer to buy this as I've had my eye on it for ages and I needed a distraction :P I originally wanted to get Luminous Light or Dim Light but I got talked into this as the sales assistant thought that it was better as a setting powder and that the other ones were better as bronzing powders. I've used this as a setting powder and I really like it. I can't see any difference in normal lighting but I seem "glowier" in darker lighting. The only problem with it is that it's so finely milled that whenever my brush touches the product, I get a lot of fallout and it goes everywhere! 3) Revlon Just Bitten Kissable Balm Stain in Rendezvous from Chemist Warehouse ($9): This colour wasn't released in Australia with the rest of the range but I'm a sucker for orange lip products and I just had to buy it when it was 50% off at Chemist Warehouse. I'm not a huge fan though... it seemed to be a little drier than the other colours. And that's it! 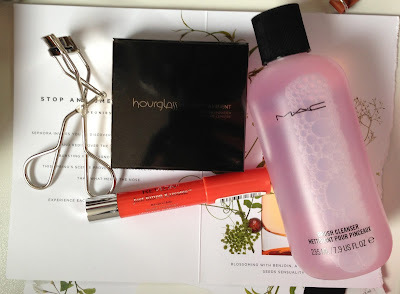 I have a post about a major haul coming up shortly :) And don't forget to add me on Bloglovin! I'm not 100% sure if GFC will be gone with Google Reader on July 1 but it's better to be safe than sorry :P You can use the button below to add me on Bloglovin :) I promise it's really quick and easy to set up an account if you don't have one already! I recently bought the MAC brush cleanser too! I looked for Rendezvous at Chemist Warehouse but they didn't have any left. :( And I WISH I could feel sorry for myself to buy an Hourglass Ambient Lighting Powder but I know I'll just feel guilty lol. I bought the second last Rendezvous at my Chemist Warehouse but to be honest... it's kind of drying! 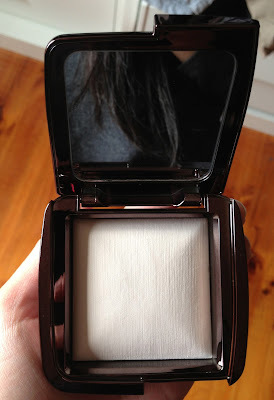 You should also get the Hourglass Ambient Lighting Powder :) It's really good! I think I'll be investing with a good eyelash curler next time too! Love the Shu Uemura eyelash curler - so worth the price! I have the Ambient Lighting powder in Lumionus Light and I definetly wouldn't consider it a bronzer. Ethereal Light looks very nice! I think I'll buy the MAC brush cleanser next time as the one I usually buy (the artiste one) is $15 and only 100ml. That eyelash curler sounds great, I have a $2 which always hurts when I use it so I need a new one! Definitely invest in this one :) It's so good for Asian eyes as well! Great haul! i really want to try the eyelash curlers, i hear so much about them. They're actually amazing! I thought that they would be overhyped but they're not! They actually don't hurt! OMG! I have Shu Uemura curlers that don't work for me! Wish I'd known that they work for you, as I'd have given you one of my new ones! Hmm might have to put them up for sale on my blog..
Really? I saw that you had the gold one... tempted to buy it off you haha. They're amazing for me! I guess my lips are too dry :P My favourite is valentine! It's such a gorgeous hot pink!